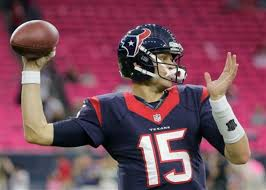 He could be the starting quarterback for the Texans with his strong arm and limited pocket agility. Mallett hasn’t exactly had the chance to play much sitting behind Tom Brady and then getting hurt in his second game starting last season. The quarterback gets the strong running game of Arian Foster to run interference while throwing to some talented receivers in DeAndre Hopkins, Jaelen Strong, and Cecil Shorts. This converted Australian rugby player is a bit of a mystery on anyone’s team. I’m not sure he will even make the 49ers squad and he is only owned in 4.3% of all myfantasyleague leagues. The entire Saints wide receiver corps is wide open after second year Brandin Cooks and the aging Marques Colston. The Saints did not draft any wide outs, so maybe they are happy with what Coleman brings to the team. Here is yours truly over-reacting to the news Dyer finally signed with an NFL team. Dyer has Latavius Murray, Roy Helu, and Trent Richardson to battle for a roster spot. I will either look really smart or silly at the end of August. At least I can stash him on my taxi squad. Who knew Smith would get named the starter for the Jets? Sure he has a short lease, but this athletic signal caller has more offensive weapons than ever in: Brandon Marshall, Eric Decker, and rookie Devin Smith. The quarterback also gets Chan Gailey as his offensive coordinator who should spark the running game as well. Can Geno Smith put it all together? There is a crowded inside linebacker situation in Philadelphia, but Ryans still has some juice left. The backer could still get traded before the beginning of the season and could be a top 24 option if he gets enough playing time. This ultra-talented defensive tackle, got injured in 2013, and took a while to fully recover. Last year there were slivers of talent oozing to the surface, but at this price, I think owners can take a chance on one of the most dominant defensive tackles of this decade. The former Florida State defender had a very productive collegian career. He gets to play in the Leo role which could lead to a lot of opportunities to the defensively starved Raiders. Edwards is definitely worth the late round gamble here. When Butler is healthy, he can be a healthy LB3. The Chargers play in the run oriented AFC West which should give him plenty of opportunities to productive.